Nevyl Reginald Hand was born 2 March 1923 in Sydney. He commenced working life as a butcher, but joined the army aged 19. He served at Tarakan in Borneo in 1945. Demobbed in 1946 his family lived at Lane Cove and he played Rugby League for North Sydney. In 1947 he married Joan Draper. He was a devastating young forward, representing Australia in England and France with the Kangaroos in 1949, before heading to Gundagai in the same year as captain-coach. He was initially unsuccessful at Gundagai, with Bill Edwards of Harden being brought in as the principal coach in 1950. Although Nevyl starred in the firsts he coached the reserves. That year he established a milk run with his brother Jimmy. In those days the milko would ladle the liquid into your containers. In 1951 he was re-appointed coach of the firsts and then the victories started. 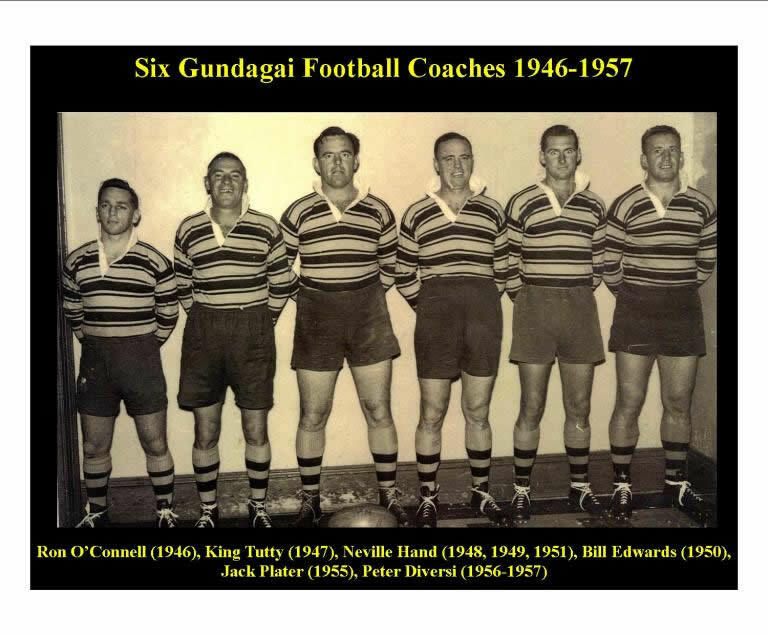 The Gundagai Tigers under Nevyl Hand won 23 consecutive Maher Cup matches from 11 August 1951 and 6 September 1952 – a then record. This was arguably the greatest Maher Cup team ever. At full strength the team included: Len Koch at fullback Paul Butz and Bill Gardner on the wings Jack Plater and Wally Towers in the centre Brian Longhurst at five-eighth Johnny Ryan half-back Forwards, Ron Battye, Noel Goodsall, Owie Hourn, Des Field, Harry Gibbs and Nevyl Hand. (Reference: Gundagai Independent 25/2/1971). 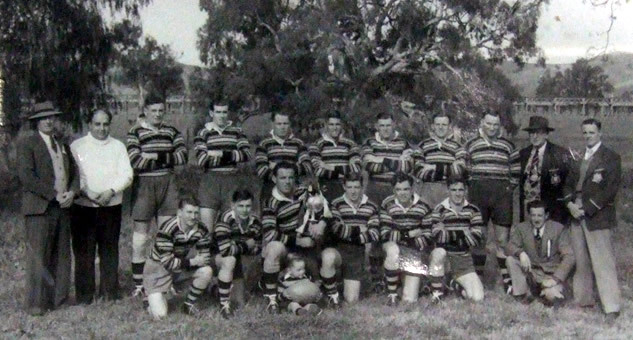 In 1951 he lead a Riverina team to a 20-10 victory over Puig Aubert’s French team at Albury. 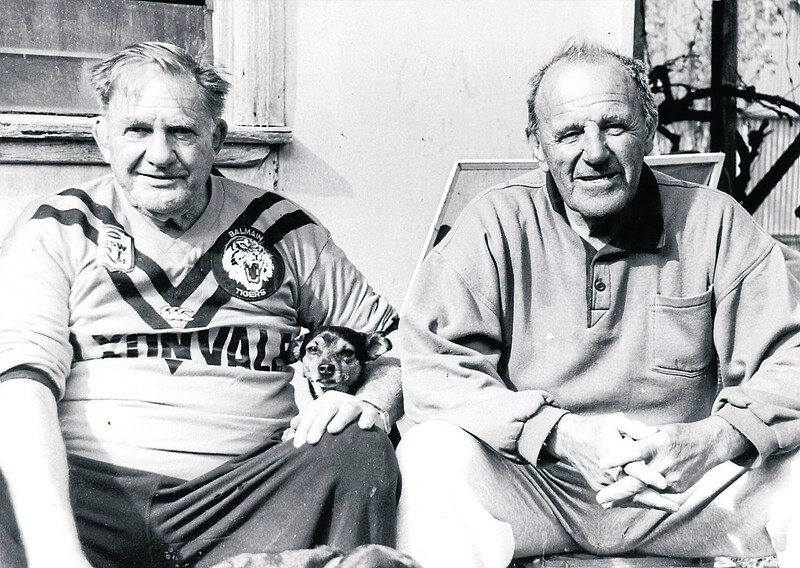 At least two of Nevyl’s brothers, Jim and Roy, were also accomplished rugby league players. After surprisingly losing the last Maher Cup match of 1952 to Grenfell, it wasn’t until 16 May 1953 that Gundagai had an opportunity to challenge again. They went to Young and trounced the Cherrypickers 29-8 in front of the largest Maher Cup crowd of all time. A serious groin injury put him out of the game in 1954. However he returned to coach Gundagai in 1958. Glowing, sincere and well merited tributes were paid to Gundagai’s football captain and coach Nevyl Hand at the footballers’ banquet held last Monday evening, and among other things stated – Mr. P. J Sullivan said that without fear or contradiction, he could say that Nevyl Hand was the best and greatest football coach to come to the bush in southern NSW. Nevyl remained living in Gundagai when his playing and coaching years were done, moving to Cootamundra in 1971. 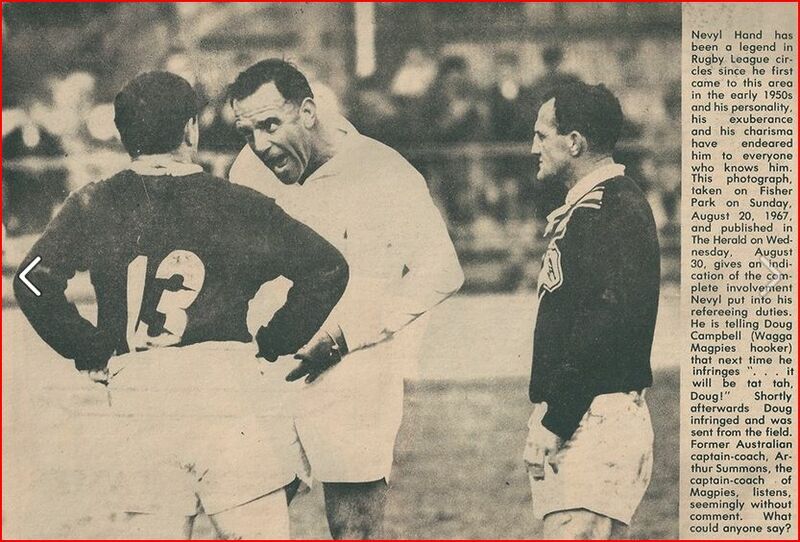 He was active in rugby league administration and was a top notch, fair and charismatic referee. As the caption on the picture below says “his personality, his exuberance and his charisma have endeared him to everyone who knows him”. Thanks to Cootamundra Remembers on Facebook. Below is a relatively recent picture of Nevyl with long time friend, Australian representative and Maher Cup champion Fred de Belin. Thanks to the Cootamundra Herald for permission to publish. Kangaroos Fred de Belin and Nevyl Hand in retirement. Nevyl Hand passed away at Cootamundra on 11 April 2014. This entry was posted in People and tagged Gundagai, Nevyl Hand. Bookmark the permalink. Thank you for the article on my father, Mr Nevyl Hand who passed way on the 11 April 2014. The article is a testimony to my father; as a man, a soldier and a Rugby League player. The information included in this article is generally accurate, except for the fictitious “yarns” provided by Mr Roy Masters, AM, which can be described as grandiose, inaccurate and insulting to my father’s memory. Allow me the courtesy to provide the correct information, without the theatrics. 1: Regarding the fight between my father and Jack (otherwise known as Snake) Slavin: There was a fight between Mr Slavin and my father – that much is true. The fight occurred at local bar in Cootamundra, and was a result of football rivalry. The fight lasted for no more than 20 minutes. The proprietor called the local police who responded promptly and ended the fight. No charges were laid; both my father and Mr Slavin were asked to pay for property damage, which they did. No further action was taken. 2: The story regarding the greyhound called Red Luby – This is an incredulous story and is highly insulting to my father’s memory. I am aware this ridiculous story has been published previously and I am disappointed Mr Masters did not have the decency to contact our family to check if the information was correct prior to writing this in a public forum. In the end, it is Mr Masters who is portrayed as the fool for endorsing this fanciful story, and he has the gall to call himself an Australian sports journalist. If you require any accurate information about my late father, My Nevyl Hand, please feel free to contact me, I am more than willing to provide information on this great man and father. Many thanks Peter for your comments. I have deleted the Roy Masters references. I would love to have more information about your father that you feel would be suitable for this blog. Thanks again, Neil.